Well, I think we can get a lot of work done fast. When I met with the governors, all of them have projects that are shovel ready, that are going to require us to get the money out the door, but they’ve already lined up the projects and they can make them work. And now, we’re going to have to prioritize it and do it not in the old traditional politics first wave. What we need to do is examine what are the projects where we’re going to get the most bang for the buck, how are we going to make sure taxpayers are protected. You know, the days of just pork coming out of Congress as a strategy, those days are over. Well, it’s not just the governors that have “shovel-ready” projects lined up for federal funding, the nation’s mayors also have plenty of projects at the ready. 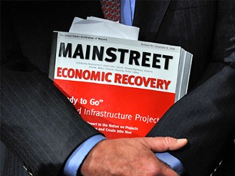 You can see what these projects are at the U.S. Conference of Mayors site where they have published a “MainStreet Economic Recovery Report” along with a database of the projects, their cost, how many jobs they are expected to create, all sorted by state. – Hercules, Calif., wants $2.5 million in hard-earned taxpayer money for a “Waterfront Duck Pond Park,” and another $200,000 for a dog park. – Euless, Texas, wants $15 million for the Midway Park Family Life Center, which, you’ll be glad to note, includes both a senior center and aquatic facility. – Brigham City, Utah, wants $15 million for a sports park. – Arlington, Texas, needs $4 million to expand its tennis center. – Miami, Fla., needs $15 million for a “Moore Park Community Center, Tennis Center and Day Care” facility. The city is also desperate for $3.6 million to build a covered basketball court and a new tennis court at Robert King High Park. Then there’s the $94 million Orange Bowl parking garage you are being asked to pay for. – La Porte, Texas, wants $7.6 million for a “Life Style Center.” And Oakland, Calif., needs $1 million for Fruitvale Latino Cultural and Performing Arts Center. And you thought infrastructure investment meant roads, bridges and schools. It is clear that any infrastructure stimulus money given to the country’s mayors will lead to thousands of tennis centers to nowhere. Here is my bleg: Let’s help President-Elect Obama do what he is promising. Let’s help him “prioritize” so the projects so that we “get the most bang for the buck” and identify those that are old school “pork coming out of Congress”. We can do this through good clean fun crowdsourcing. Who can help me take the database on the Conference of Mayors site and turn each project into a wiki-page or other mechanism where local citizens can comment on whether the project is actually needed or whether it’s a boondoggle? How can we create an app that will let citizens separate the wheat from the pork and then sort for Congress and the new administration the project in descending order or relevancy? I have some technical chops, but in many ways I wouldn’t know where to start. Any takers? If there are, my colleagues and I would love to dive into this and we can probably scrounge up some resources. Who’s with us?